Note: The following is a paper I've prepared for my Masters in Infrastructure Planning and Management at the University of Washington, Seattle. I think you may find this interesting in light of today's concerns about water for thermal power plants. I have been associated with electricity generation in one form or other as part of my profession since 1974. I have operated nuclear power plants and been associated with hydroelectric generation, combustion turbine generation, coal-fired generation and even wind/solar and distributed generation such as diesel generators. During this time I've learned that water is a very critical and foundational service for the thermal plants in particular. Unfortunately as time progresses we are witnessing more issues relative to reduced availability and quantity of water for these plants. 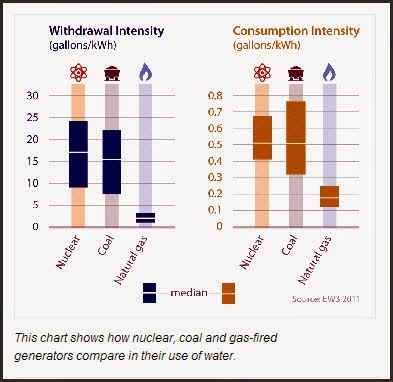 Additionally there are challenges with climate change causing the water temperatures to rise and thus make it more difficult to efficiently generate power at some nuclear and coal-fired plants. 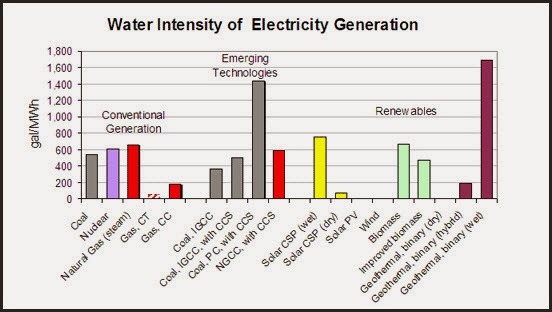 Not only is a substantial quantity of water required for electricity generation but you should also consider that the discharge from the plant could contribute to increasing the temperature of the regional water supply which has impacts on fisheries, algae blooms, etc. This report goes on to note that reduced water availability and warmer water – caused by increasing air temperature associated with climate change – will result in higher electricity costs and reduced reliability. Those plants that rely on once-through cooing are the most vulnerable versus those that recycle their cooing water via cooling towers. Discharging water at elevated temperatures causes yet another problem: downstream thermal pollution which can affect life cycles of affected aquatic flora and fauna. Also, this higher temperature could be an added impact on downstream power generation using the same water for cooling. Overall, this appears to be a very interesting area to pursue further research and review of the current issues with water, electricity generation and climate change. Clean Air Task Force. "The Last Straw: Water Use by Power Plants in the Arid West." The Last Straw: Water Use by Power Plants in the Arid West. April 2003. http://www.westernresourceadvocates.org/media/pdf/laststraw2009.pdf (accessed January 12, 2014). Fowler, Tom. More power plant woes likely if Texas drought drags into winter. August 24, 2011. http://fuelfix.com/blog/2011/08/24/more-power-plant-woes-likely-if-texas-drought-drags-into-winter/ (accessed January 12, 2014). Hickey, Hanna. Nuclear and coal-fired electrical plants vulnerable to climate change. June 3, 2012. http://www.eurekalert.org/pub_releases/2012-06/uow-nac053112.php (accessed January 12, 2014). Koch, Wendy. Climate change causes nuclear, coal plant shutdowns. June 5, 2012. http://content.usatoday.com/communities/greenhouse/post/2012/06/climate-change-makes-nuclear-coal-power-plants-vulnerable/1#.UtLevfRDua8 (accessed January 12, 2014). Spiegel, Jan Ellen. Millstone shutdown is a sign of broader power problem caused by climate change. September 24, 2012. http://www.ctmirror.org/story/2012/09/19/millstone-shutdown-sign-broader-power-problem-caused-climate-change (accessed January 12, 2014). van Vliet, Michelle T. H., John R. Yearsley, Fulco Ludwig, Stefan Vögele, Dennis P. Lettenmaier, and Pavel Kabat. "Vulnerability of US and European electricity supply to climate change." Nature Climate Change (Macmillan Publishers Limited), June 2012: 1-6. Western Resource Advocates. Water Use for Energy. n.d. http://www.westernresourceadvocates.org/water/waterenergy.php (accessed January 12, 2014).